Truong Vo-Van knows Concordia isn’t known primarily for its research, but he hopes to help change that perception. 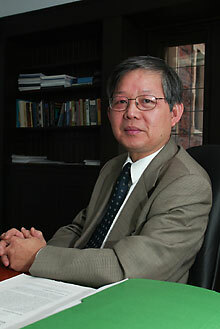 Dr. Vo-Van is the newly appointed Vice-Provost, Research. He reports to the Provost and, through the Provost, to the Rector, and is a member of the Rector’s Cabinet. The new position reflects a firm commitment to changing the university’s image. Vo-Van says Concordia’s reputation for teaching excellence is well deserved, and he wants to boost the school’s research profile to similar status. As both a physicist and administrator, Vo-Van knows academic research first-hand. He comes to Concordia from the Université de Moncton, where he founded the Thin Film and Solar Energy Research Group and held the position of Vice-President, Academic and Research. Only weeks after taking on his new post, he went to Japan. He represented Concordia at a multi-university conference in Tokyo and Kyoto on the importance of research collaboration among schools, as well as between the academic and private sectors. “I’ve learned how research is done, and what a researcher’s needs are. I know what kind of environment a university needs to encourage the best research. “I see my role very much as a facilitator of research. I’m not doing the research myself, but along with the very good team of the Office of Research, I’m helping other researchers to get it done. That environment, according to Vo-Van, has several components. Infrastructure (libraries, laboratories, equipment) is a given. Then there are what he calls “services,” meaning ready access to information about internal and external funding (e.g. grants), help in preparing funding proposals, information about research polices, etc. “But the most important factor is people,” he said. “If you are surrounded by talented researchers and a good working atmosphere, it makes for a stimulating environment in which to exchange ideas. A critical mass of researchers is a necessity in the quest for quality. The new Richard J. Renaud Science Complex on the Loyola campus fulfills Vo-Van’s notion of a stimulating environment, and is a big-ticket indication of Concordia’s newfound commitment to research. By uniting many previously scattered departments under a single roof, the Complex promises to foster an atmosphere of inter-disciplinary creativity. The downtown Integrated Engineering, Computer Science and Visual Arts Building promises similar benefits. These, says Vo-Van, are very good starts. Working closely with the provost, the deans, the associate deans, the Office of Research, and the researchers themselves, Vo-Van is taking stock. He will issue an initial report, followed by annual updates. “We have to be very honest about our strengths and weaknesses,” he said. He admits that the criteria for quantifying success and progress are still a point of discussion, but suggests a few guidelines. Keeping in mind the importance of inter-institutional collaboration, he suggests the need for “friendly competition,” the comparison of Concordia’s overall research financing against universities of similar size and scope. Vo-Van plans to measure financing on both a per-faculty and per-researcher basis, and will also take into account factors such as the number of faculty currently holding research chairs. Another measure of research performance is the number of graduate students. “Then there are the non-financial criteria,” he says. “How do we compare in terms of number of publications, and what is the quality of the journals? Concordia University has great potential, he said. “We are at a turning-point in our history. We’re recruiting the best new people that we can, and looking at their research backgrounds before recruiting them. Once we have that critical mass in place, we can begin to gradually develop the areas of financing and achievements.